This Recreational Waters Program is responsible for the enforcement of laws and regulations relating to approximately 3,200 public pools in Los Angeles County. This includes swimming pools, spas, wading pools and special purpose pools located at hotels and motels, public and private schools, health clubs, city and county parks, mobile home parks, resorts and organizations, medical facilities, and water theme parks. In addition, the program is responsible for the plan approvals of all new public pools and renovations of existing pools. The program also certifies individuals as Swimming Pool Service Technicians. All individuals engaged in the business of maintaining pools are required to be certified by Los Angeles County. We are also responsible for monitoring ocean water and contact sport areas and taking appropriate action when water quality criteria are not met or when an incident, such as a sewage spill, occurs. 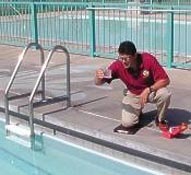 In addition, staff inspect and conduct bacteriological tests at fresh water swim areas. To report a sewage spill or if you have any questions on ocean water quality, advisories, closures or other related questions or concerns contact us.